Anton Stanislaus Balasingham, an enigma that captured the essence of the Tamil resistance and communicated some of its deeply rooted spirit to the outside when it was necessary. Diplomats indoctrinated in the most renowned schools that sat opposite him envied his quick wit. Various powers that wanted in vain, to entice our nation’s leaders off track acknowledged his astute resolution to the principles of Eelam Tamils. His Sinhalese counterparts were always in the shadow of his calm, collected demeanour. The nature of his character attracted a vast array of people. He was a progressive thinker; humble but not weak; simple but yet deep. He remains a guide to many of us embarking on our understanding of the politics of our national liberation movement. He found a fine mix between spoken and written word and captured the attention of diaspora Tamils in great numbers. His wife, Adele Ann Balasingham, observes that “the many socio-economic problems he faced and overcame throughout the chapters of his life stretched all dimensions of his being to capacity, and he ultimately came to view goodness and righteousness not as words culled from the pages of books or something indoctrinated into us, but rather, as a harmonised faculty of mind and action emanating from our essential being”. His deep connection with our nation and his commitment to the fight of our liberation is no surprise then from such a man. Even his crippling health could not destroy the teachings he bestowed upon our nation. The Tamil people rejoiced at his incredible adeptness at making light of situations through structured, rational thought. His life’s work to elevate our struggle into the spotlight of the world without losing its essence has been an overwhelming success. He was, still is and will continue to exist in the minds of our people as an irrevocable asset. For every young activist, every young Tamil cub, especially those in the diaspora who are forced to cooperate with all offices, his life and work must be etched into our soul as an example of how to never surrender our principles or Tamil Eelam, but to operate with tactful guile in a forever changing international terrain. “It is an unfortunate personal tragedy. However, when compared to the vast ocean of the collective tragedy faced by my people, my illness is merely a pebble.”, he said. 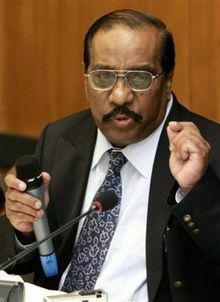 “I am deeply sad that I am crippled by this illness, unable to contribute anything substantial towards the alleviation of the immense suffering and oppression of my people.” Even in his most pained days where one is expected to self reflect, his obsession was the people and character of Eelam – he was selfless. May the words of our Thesathin Kural echo in our hearts until one day they are housed in every public library in a free Tamil Eelam.